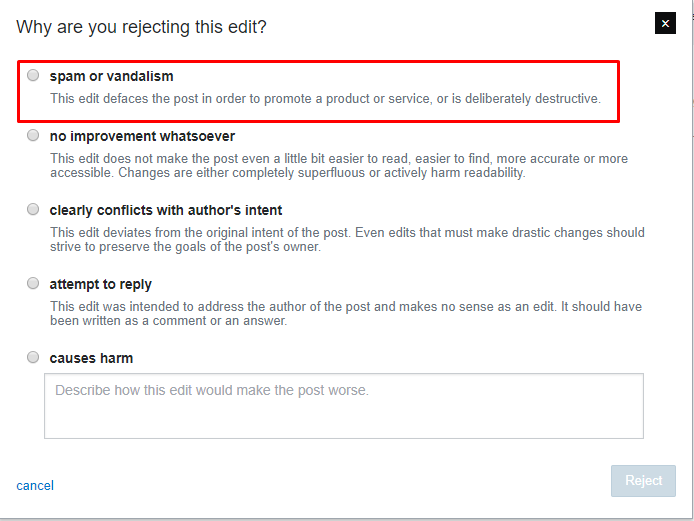 If there is some abusing suggestion from anonymous user, is there a way to take some action against that? or some kind of penalty? Reject as spam/vandalism. Do not use a custom message as you appear to have done; not only is it a waste of keystrokes given that this is an anonymous user (also most abusive users aren't going to listen to you anyway), but rejecting as spam/vandalism as opposed to using a custom message will also cause the edit and the originating IP to be fed into the system to train it to detect and block further abuse. Just select this as your reject reason whenever you find edits like these. This will get picked up by the system and the mods will go after them. Not the answer you're looking for? Browse other questions tagged discussion review suggested-edits abuse . what does mean for proposed yesterday by an anonymous user?